We buy junk cars, vans, SUVs, and trucks and pay cash in Nevada! We provide the fastest cash for junk car service in Nevada. Nevada was put on the map way back in 1859 when the Comstock Lode, the largest deposit of silver in the U.S. was found. Since then, Nevada has produced more silver and gold than anywhere else in the nation! If you have an old junk car sitting around your property, The Clunker Junker can turn it into gold. We pay cash for cars in Nevada and will pick up nearly any complete vehicle completely free of charge. We buy cars, trucks, vans, and SUVs and pay top dollar for them. Rather than waste your time with a Nevada auto salvage yard, sell your junk car to The Clunker Junker instantly instead! When you’re looking to sell a junk car in Nevada, you have a few options. Why gamble on unreliable private buyers on websites like Craigslist or Offerup? Why roll the dice trying get cash for junk cars from a junkyard that will tell you one offer on the phone, and then another price when you show up? Instead, put it all on black and go all in with The Clunker Junker. We’ll double your money! You might be tempted to roll your junk car off the Hoover dam straight into lake Meade, but there is an easier way to get rid of your car. Start by filling out our simple vehicle condition form on this page and in most cases you’ll have an instant offer for your junk car. Our junk car removal services usually take between one and three business days to complete in most cases, and we often pick up cars on the same day they are submitted. Whether you're looking to junk a hand-me-down Camry or few-years-old C-Class, we'll need to some pretty standard details on you and your junker. Get ready to tell us the exact year, make, and model of the car, so that we can give you a rough idea of what we can offer you.Has your car been at the mercy of too many Nevada summers to count? No need to sweat: The Clunker Junker offer top dollar for junk cars. Like the cash offer we’re able to give you? Well, then click “accept”! After that, we'll need some additional information like your phone number and pick up location in The Silver State, and in some cases photos to verify condition and ownership documents. We'll schedule your vehicle for pick up with our awesome Nevada junk car buyer once we have all the info we need. When the junk car removal specialists arrive, he or she will give you your cash or check payment for your keys, title, and vehicle. Towing is free, so you can rest easy knowing there are no hidden fees. How Much Cash For Junk Cars can I get in Nevada? We buy junk cars in Nevada, even if your car hasn’t exactly had a pampered life. However, we do separate our junk cars into three separate groups when we figure out how much to offer you. For junkers that have become yard ornaments, we’ll help take them off your hands. Because these cars are either recycled or sold to junk yards for raw materials, the size and weight of the vehicle will determine its price. Generally speaking, you can expect around $50 to $225 when selling us a car that hasn’t moved in years. If you’re car still might have some life in it yet, it might be classified as what we call an “in-betweener.” These cars still have parts we can sell, so they have higher values than complete junkers. Even if they don’t drive, their parts value makes them worth more than rusted-out beaters. Because the gray area these cars occupy, exact price tags are a bit harder give you up front. Then there are the cars that could be sold as great used cars. These “My car isn’t junk!” rides are driveable and may only need minor repairs. For cars like this, you can expect us to pay $200 to $10,000. We’ll place a bet on them at auction rather than dismantling them at a junk yard. 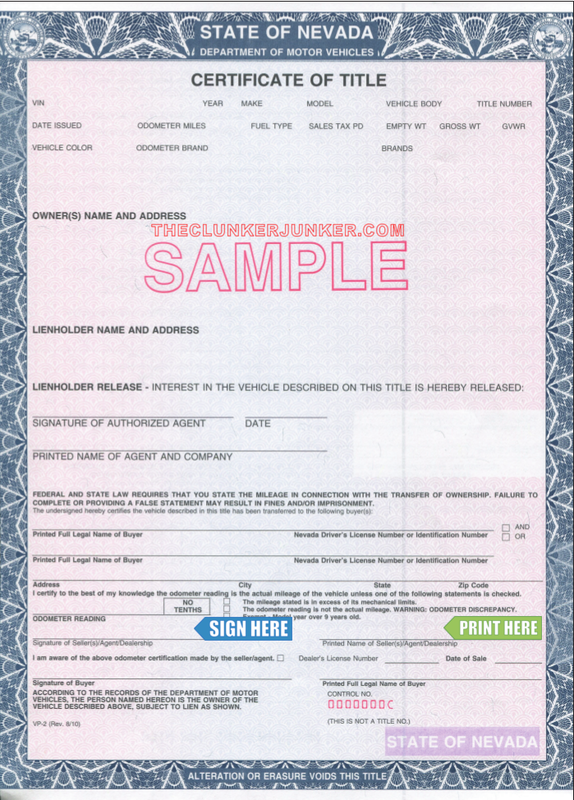 We have put together a simple guide and example for how to sign your Nevada title when you are selling your vehicle. If there are multiple owners listed on the title, they must all sign the title unless the names are separated with "OR". On a Nevada title you will want to sign and print your name on the front of the title, just under the "odometer" reading section. Make sure you don't accidentally sign on the buyer line, and don't write anything in the dealer only sections on the back. First sign the front of the title where indicated by "Signature of Seller(s)" (see image). 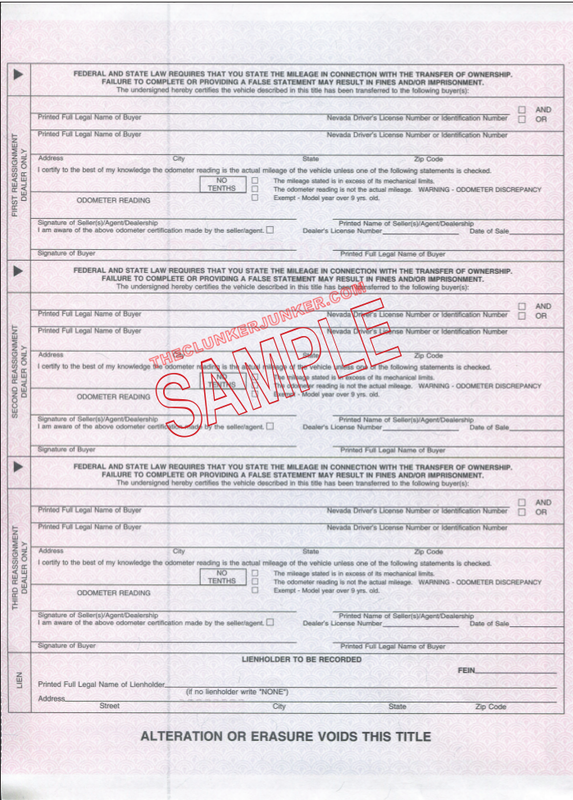 Fill out the Application for Duplicate Nevada Certificate of Title. Bring your duplicate title application to your local DMV office. Please note that there may be a six week waiting period before a duplicate title can be issued and the cost is $20.00. (Paid to the NV division of motor vehicles). Getting rid of an abandoned vehicle in Nevada can be a difficult process. Unfortunately, you cannot just sell any junk car that ends up on your property if you do not own it. You'll need to follow the Nevada abandoned vehicle removal procedures. We have given a general overview of what that entails below. To have an abandoned vehicle removed from your private property, you must first contact your local law enforcement agency. They will dispatch a towing company to remove the vehicle. If the last registered owner and/or lienholder have not shown interest in the vehicle, the car wrecker in possession of the vehicle may be granted a Junking Certificate. Are you able to buy my car if I don’t have the title? Only under fairly limited circumstances. Your vehicle may need to meet certain age requirements, and not all of our buyers in Nevada buy cars without titles. The ones that do will offer significantly less and require proof of ownership in the form of an ID that matches your registration. 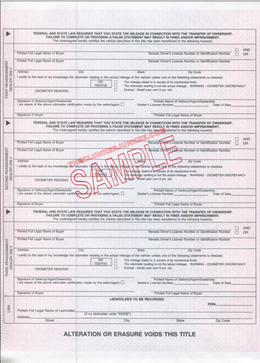 Nevada often changes their title documents from year to year. If you have questions about your specific title, please contact your Nevada DMV. Yes, unless you are transferring the plates to a new vehicle. You can return the plates to your local DMV office. This should be done within 30 days of the sale of your vehicle. 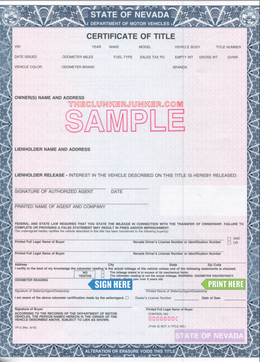 You must fill out a vehicle bill of sale and the online vehicle resale notification. This should be done within five days of the sale of your vehicle. Our team at The Clunker Junker is dedicated to giving you the best deal on your junk car. Ready to get rid of your old car to make room for a newer wheeled-whip or just want to put a little extra money on the poker table? Reach out to The Clunker Junker today, accept your cash offer, and we’ll help you free up some driveway space, all while putting money in your hands. "There is a small dent on top of the car, and there is also a small dent and some scratches on the lower side and the top on the passenger side. The car will turn on, and the lights will come on, but the car will not start." "There is no rust on the vehicle. There is a dent on the driver side, but it's not bad. We have been told that it needs a new engine. It has lost pressure. It has not been driven for about two months. The alternator and the battery were replaced in September of 2015. " "I don't have any need for it any longer, and without the title, I'm having issues selling it. It does need a new exhaust, but it is still able to be driven. It has about 48,000 miles on it. " "The A frame needs to be straightened after the passenger side was dented by scraping a fire hydrant. Additionally, the catalytic converter was stolen and needs to be replaced. Lastly, the steering pump, serpentine belt and rack and pinion have all been replaced within the past two months. I have records for these repairs. " "The transmission is out. That's the only reason we are junking it. The motor still runs and was maintained very well. We also put in a new front end about two years ago." "The vehicle has a broken taillight, not all of the power windows work, there's no radio, there's minor damage on the hood and hood the latch, and there's no heat or A/C. I'm junking it because I don't want to spend the cash on the repairs, and I already have too many cars on my insurance now." The Clunker Junker is one of the top junk car buyers in the state of Nevada. To date we have made instant offers on over 10 thousand vehicles across the state, totaling over $2.7 Million offered! We were not able to purchase many vehicles without a valid title. We also buy cars on a wide spectrum of conditions and 54% of the vehicles we've made offers on in Nevada do not start or drive. Many also have moderate to severe body damage. Las Vegas in San Miguel County was our top producer, followed by Reno.